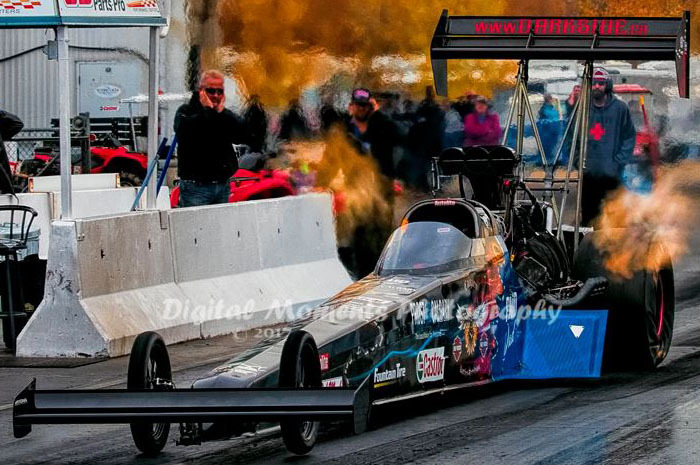 Calgary based, community focused, and family owned and operated by David, Kelly and Nikolas Fedorowich, Dark Side Racing is Western Canada's only Top Fuel representative. Team patriarch, David Fedorowich, has been involved in professional drag racing for over 40 years as a driver, tuner, fabricator and innovator. The veteran drag racer has competed in both NHRA and IHRA sanctioned events in the professional Top Fuel category. In 2012, Nikolas traded in his chef’s apron to return to the family business. Under the tutelage of dad/ David, he has become skilled in all aspects of race car set up. From engine tuning to clutch set up, Nikolas has earned the title of Car Chief of the Dark Side Racing Top Fuel dragster. The Fedorowich family kicked off their current campaign in 2012 with a long-term vision of creating a racing series that would energize the nation’s passion for Nitro. Outlaw Fuel is that series! There’s nothing subtle about drag racing, and nothing fills the stands like a Nitro show. The Outlaw Fuel series will thrust Canadian race fans into the world’s fastest and most powerful motorsport!